You have just been awarded the 30th Premi International Catalunya, congratulations! I’m grateful for this prestigious award, this is a special occasion and I am well aware of that, but I must tell you it doesn’t take so much to get me back here. I love the people and this country. This is the first time it has been awarded to someone from the technological field. That makes it even more astonishing, but it’s also important because it says something about 21st century Barcelona: that it’s focused on technical ground, and that’s going to be important for its future. What is your relationship with Barcelona and Catalonia in particular? I’ve been coming here for over 20 years, I have friends whom I met through the Internet, some of them I met through the Internet Society; we share a common interest in wine, so whenever I’m here we try and get to Priorat. I’m also very interested in history, and I found that the Roman ruins in Tarragona are spectacular and even better kept than the ones in Italy. There’s so much to like about this part of the world. Wherever I go, there are echoes of the Catalan world, which I always enjoy. Where does Catalonia stand in terms of the Internet compared with the rest of the world? My impression is that in Spain, the penetration of the Internet is lower than in the United States. Catalonia I think has a higher penetration; it was among the earliest to adopt the Internet: in Tarragona, you have Tinet, the Tarragona Internet, started by Manel Santromà in 1995, just when the World Wide Web started to become visible. My impression is that in Catalonia there’s a heavy focus of attention on and an interest in technological businesses in this part of the world, and that takes infrastructure. You are considered one of the founding fathers of the Internet, was it hard to convince people that the Internet would be the future of communication? It might be surprising, but no, because when I started working on this we had a particular objective in mind, which was to build a technology that the US defence department could use for what it called “command and control”. That was our primary focus, it was an engineering problem. However, we discovered that the Internet grew in stages. I didn’t try to tell people what the Internet of the 21st century would look like because I didn’t know. You could anticipate the possibility, but not necessarily predict it. You once said that science fiction does not remain fiction for long. How do you see the Internet in 10 years? First of all, half of the world’s population now has convenient access to the Internet; by 2029, I guess that will be at least 80%. A lot of it will be mobile, wireless. Wireless communication speeds are going up, more devices will be equipped with communication capability, we will have a huge population of devices we call the Internet of Things: household appliances, and so on, and we’ll certainly have self-driving cars, which we are already experimenting with at Alphabet, Google’s parent company. Most devices will have voice capability, you’ll be able to have conversations with them, ask for certain tasks to be done for you, reminders, reservations. We’ll be wearing all kinds of measurement devices, sensors on our bodies which will help us understand the state of our health so we can be warned ahead of time whether a potential hazard or problem has been detected. In terms of Big Data, there will be a lot of data about ourselves, which can be analysed to help us live more healthy lives. So I think the Internet and the devices attached to it, will have grown quite dramatically over the next 10-year period. With so much Big Data some people are worried about their privacy. There’s a whole list I’m worried about: safety, privacy, security, reliability, and autonomy. We at Google believe that personal information should be under your control. We don’t share anybody’s information, unless they tell us to. We believe in protecting people’s data, it’s all encrypted. It’s true that we can use your searches on Google, for instance, to figure out what ads we should show you, but we don’t sell your information to anyone, and we don’t sell the users information to the advertiser. But on the World Wide Web, there might be photos of you taken by someone who doesn’t even know you were in that picture, and it’s posted somewhere. There is a peculiar problem with technology, that is not necessarily under anyone’s control, it’s a world where it’s harder to remain absolutely private, because of the technology, not because of any ill intent by anyone. What should we avoid, or worry about? First you should think about the information you choose or allow to go on the Internet. But sometime you don’t have any idea that something is even up there. But there is a second thing you should be worried about. Let’s imagine you take lots of photos with your phone, and store them in the cloud. In 50 years, what happens to those photos after people have passed away? If the software you used doesn’t run any more, what happens to the emails, spreadsheets, tweets, and so on, all that digital information over long periods of time? I’m worried that we don’t have a process to preserve all that digital content, so I’ve been running around saying that there’s a digital dark age coming, when the digital information we created just disappears because the software that knows how to interpret it doesn’t run any more. So we need to create a preservation regime, we need archives that understand digital content as well as physical content, that’s a work in progress. Vinton Cerf (New Haven, Connecticut, 1943) is considered one of the founding fathers of the Internet, together with Bob Khan. In 1992, Cerf and Kahn, among others, founded the Internet Society (ISOC) to provide leadership in education, policy and standards related to the Internet. At present, Cerf is a vice president and Chief Internet Evangelist at Google. In this role, he has become well known for his predictions on how technology will affect future society, encompassing such areas as artificial intelligence and environmentalism, among others. 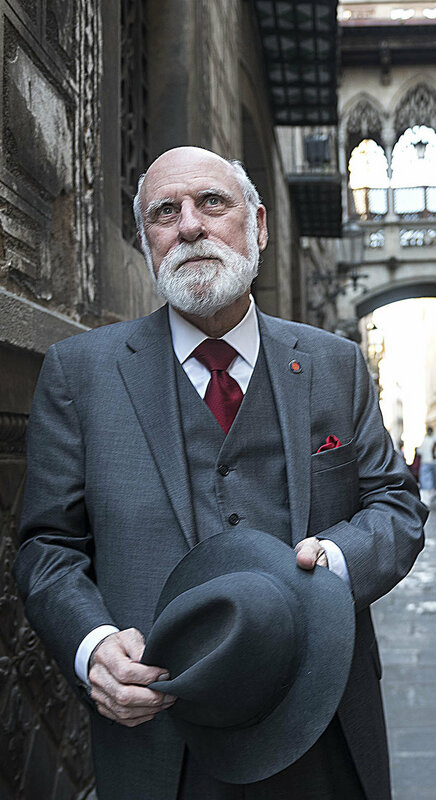 On March 25, Cerf visited Barcelona to receive the Premi Internacional Catalonia, awarded by the Catalan government.